Somervell County courthouse, Glen Rose, Texas. 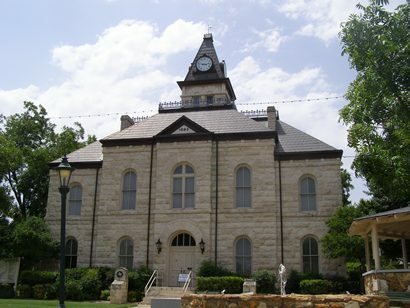 The Somervell County Courthouse is a simple two story structure featuring elements of Romanesque Revival and General Grant architectural styles. Intersecting hallways on the first floor divide the first floor space into four sections. 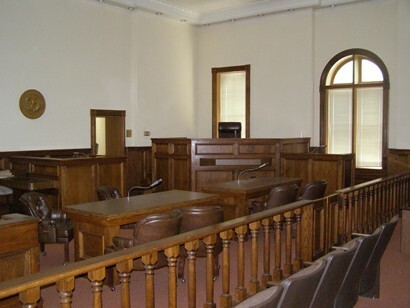 The second floor features a courtroom and some office space. The building is modest in size, oblong in shape, and approximately 60 feet wide and 40 feet deep. Built 1893. Late Victorian style. Native limestone construction. County was organized in 1875 and named for General Alexander Somervell (1796-1854), Texas soldier, colonist, and statesman. Court was first held in an old store across road from Barnard's Mill. A log cabin (1 block w) was used later. Third courthouse (first on this site) was finished in 1882 but burned in 1893, along with many valuable records. Present structure has a fireproof vault. When this building was started ca. 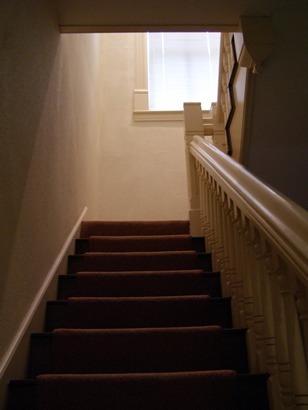 1880, they got as far as the tops of the first-floor windows. Financial difficulties forced the court to wait a few years before finishing the building in the late 1880s. This structure burned in January 1893, but the walls were retained in the present building. The courthouse square, much like the courthouse building, is modest in size. The two most notable buildings on the square are the First National Bank Building and the Campbell Building. 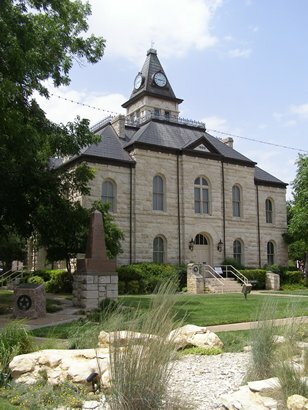 The courthouse square has been a popular gathering place for Somervell residents since the late 1880's. Back before cars and grocery stores, farmers would bring stock animals and other goods to the square to sell. That tradition is still alive and well today. Local farmers continue to bring fresh fruits, vegetables, and other items to the town square for sale. They set up on the west side of the square where there are benches and plenty of shade provided by old pecan trees. Both the farmers tasty offerings and the conversation are refreshingly unique. Around 1860 Charles and Juana Barnard built a three story stone gristmill along the Paluxy River. The town that eventually grew around the mill was called Barnard's Mill. 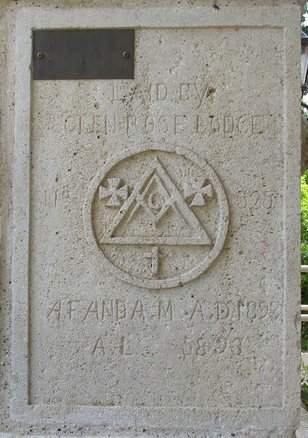 In 1871 T.C. Jordan, bought the mill and surrounding land from Charles Barnard.Mrs. T.C. Jordan called the area around Barnard's Mill Rose Glen as a reminder of her native Scotland. Years later the town's people voted to rename the town Glen Rose. 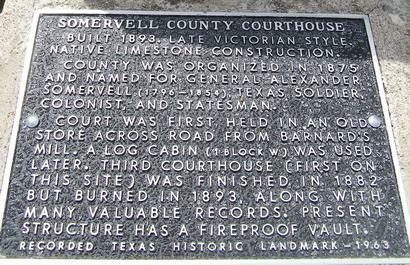 The county of Somervell was formed in 1875 from about 200 square miles of land perviously part of Hood County. The county name honors Lieutenant-Colonel Alexander Somervell. By 1876 the town population grew sufficiently that T.C. Jordan believed the time was ripe to build a town square. Jordan promised to build a county courthouse if some of the town's citizens would buy property around the square. 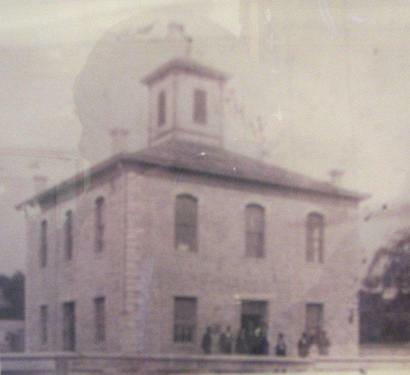 The first courthouse on the square was completed around 1892 and burned down in 1893. Second courthouse on the square, the present day structure, was ordered built by the commissioners' court in 1893 and completed late in the same year for a cost of $13,500. This courthouse employed elements of the Romanesque Revival architectural style. The building also featured a mansard roof treatment and ornamental iron crestings which are characteristic of the General Grant style. The courthouse was constructed of locally queried limestone. In 1902 a tornado damaged the courthouse and many other buildings on the town square. The courthouse roof and clock tower were severely damaged. 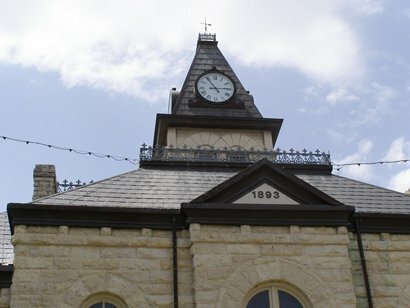 At that time, the small rural county didn't have the financial resources to properly repair the roof or replace the clock tower. A modest roof repair was made by local craftsmen which omitted the clock and some of the ornate details of the original roof. 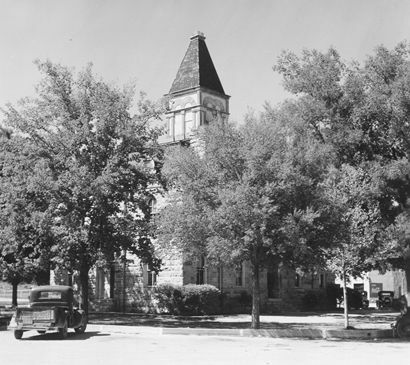 In 1986 the Somervell County Commissioners' Court voted to restore the county courthouse. The work was completed by Ray J. Miller Construction Company of Meridian under the direction of architects Huckabee and Donham of Stephenville, Texas. Final cost of restoring the building was $601,111.20. Leach, Dorothy, The Story of The Somervell County Courthouse. Somervell: Somervell Historical Commission, 1987. Texas Historical Commission, Texas Historic Sites Atlas. http://atlas.thc.state.tx.us/, 2003.